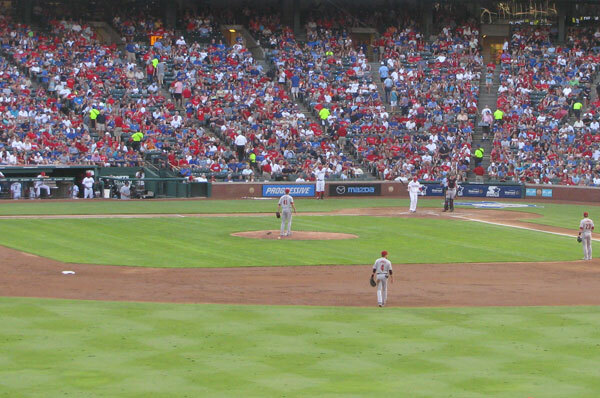 Travel to Arlington, Texas and watch the Texas Rangers play at the newly renamed Globe Life Park. Located just minutes from Downtown Dallas! Our travel packages in Arlington offers affordable lodging within walking distance, plus a fully guided ballpark tour, great seats to the game, and dining and shopping discounts! Sports Traveler has your Texas Rangers Ticket to the game. Be there at the Globe Life Ballpark in Arlington to see the Rangers win. Purchase securely online in our real time inventory! Customize your own Texas Rangers Travel Package! Let us customize your tour to a Texas Rangers Game! Tell us about the type of trip you would like to take and let us design a tour package just for you and your family! Are you interested in any additional options? Since its opening on April 1, 1994 Globe Life Park in Arlington, Texas has seen its fair share of history. Some of the most notable moments from Globe Life Park’s history include Kenny Rogers’s perfect game against the Angels in 1994, the first MLB interleague game on June 12 1997, and the World Series in 2010 and 2011. Many great players have also called Globe Life Park home, including Josh Hamilton and Kenny Rogers. The ballpark boasts many unique features such as a built in Rangers Hall of Fame behind right field. The Rangers Hall of Fame houses numerous pieces of memorabilia from some of the Rangers greats and even holds a 235-seat theater. Other iconic parts of the ballpark include Greene’s Hill in center field which is a sloped section of the park meant to help batters contrast their vision when a pitch is coming at them. The park features a seating capacity of 48,114, sixth amongst all of MLB’s stadiums. Other notable sights at Globe Life Park include the statues Vandergriff Plaza commemorating Tom Vandergriff and Nolan Ryan. The park also features newly renovated all you can eat seats that include unlimited unlimited grilled chicken sandwiches, hot dogs, nachos, peanuts, popcorn, and soft drinks. The best seats in the ballpark would be near both dugouts; these seats are just a few feet away from the playing field, giving you a closer look into the action. There is no better area to visit on a vacation than the city of Arlington, TX. In between visiting Globe Life Park for a Rangers game, visitors can take in the local attractions in the city. Right in the neighborhood of Globe Life park is AT&T Stadium, home of the Dallas Cowboys, this famed stadium offers daily tour options for fans looking to get an in-depth look into the stadium. Six Flags Over Texas and Hurricane Harbor Water Park also resides in Arlington. Each park offers a day full of thrills and excitement for travelers. These theme parks are highly recommended for travelers on family vacations. Nothing beats a weekend of baseball and rollercoasters! The shopping and dining cannot be beat in Arlington where southern dining awaits you during your stay. Local shopping options in the area include The Parks at Arlington and Lincoln Square. The Parks offers countless shopping options and movie theatre for travelers while Lincoln Square that offers nightlife options for you after your day of baseball.